and let your clients book appointments online! Choose themes specifically designed for CPAs, accountants and bookkeepers. Whether you are a one person shop or have a full staff, your site will be professional and express the personality of your business. Absolutely no code or design experience needed. Do everything on one screen. Click anything to edit, and publish instantly. Our responsive templates look great on any device, automatically. Customers book wherever they are — and select the service, staff member, and time that works for them. Automatic text and email reminders ensure customers always remember their upcoming appointments. Configure your staff and services availability to match your business. Access daily and weekly views, easily cancel or modify appointments. and schedule your appointments online. Tax season remains one of the busiest times of year for accounting businesses. 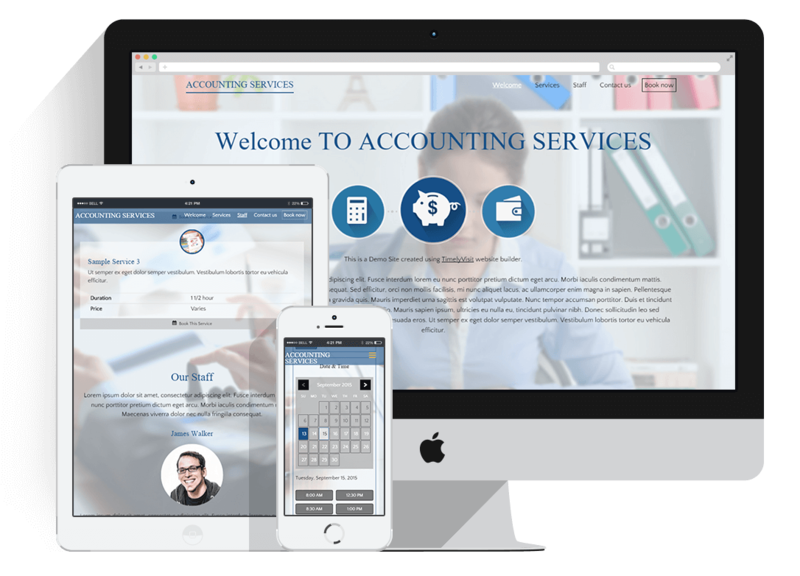 Take some of the hassle out of your day and increase the productivity of your business by creating your own custom website, allowing your clients to schedule appointments online at a time that is convenient for both your accountants and them. You will be able to easily navigate through your calendar to print schedules for your employees, add and eliminate new staff members and keep track of returning clients. As clients learn of your new service, you and your employees will spend less time answering the phone, allowing you to get more work done. Clients will also appreciate the ease of scheduling an appointment via a simple click of the mouse, increasing your number of returning clients. © 2014 TimelyVisit.com | All rights reserved.